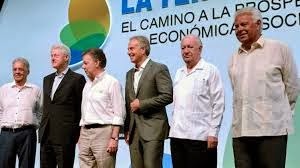 Last week, former U.S. President Bill Clinton and former British Prime Minister Tony Blair attended the”Third Way” summit in Cartagena, Colombia. President Juan Manuel Santos focused on his peace efforts with the Marxist Revolutionary Armed Forces of Colombia (FARC) rebels. Clinton said "you will never get to the final reconciliation of your country if you don't finish this peace process" and "there will always be specific things that you would still have to work out over the years ahead.” Blair said peace "means genuinely giving up on violence and a genuine embracing of peace" Note: Interpretations of what the “Third Way” is vary. Santos's view is that the “extreme center” is better than leaning to the left or the right. Colombia has experienced significant economic growth in recent years, but unresolved issues with the FARC remain an on-going challenge. Santos was recently re-elected to a second term as President but his popularity is not broad based. His “Third Way” aspirations will likely require significant work and compromise. Note: unresolved issues with the FARC include 1) the surrender of weapons, 2) compensation for victims and 3) how a final agreement would be ratified.